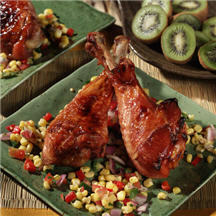 Marinated in traditional Caribbean flavors like pineapple, garlic, brown sugar, clove, allspice and cayenne, these turkey legs are practically jumping with sensational flavor. Place all ingredients except turkey into a blender and blend until thoroughly mixed. Pour mixture over turkey and marinate for 1 hour in the refrigerator. Bake for 1 hour or until internal temperature reaches 170°F (80°C), basting occasionally. Note: To reduce calories and fat content, remove skin before cooking.